In early 2014, Mad Mimi commissioned Copy Hackers to optimize the Mad Mimi pricing page for an A/B test. The goal? To increase click-thrus to each plans’ sign up page. In one variant (Variation C), they replaced the infinity symbol — an abstraction that is only immediately intuitive for mathematicians and pool boys — with the layman’s term, Unlimited. They also added Premier support and White glove support as benefits; and changed the copy in the main CTA buttons from Sign Up to Get Started. 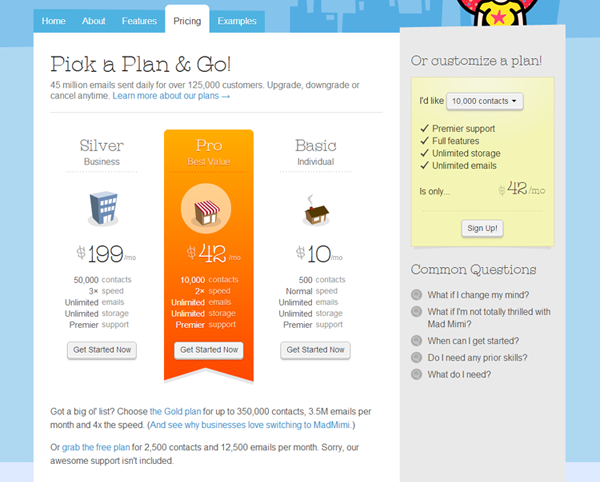 In the other variant (Variation B), in addition to the optimizations listed above, they decreased the number of showcased plans from four to three; changed the order of presentation so the most expensive plan was listed first; and changed the copy in the main CTA buttons to Get Started Now. According to Copy Hacker’s Joanna Wiebe, who worked on the project, both variants resulted in a massive, triple-digit increase in click-thrus — ranging from 238% to 465% in lift for Variation B; and 492% to 598% for Variation C.
Making Variation C the clear winner; and the A/B test a high-five-able success. Proving once more the awesome power of the A/B — that, oftentimes, a few simple copy edits can make a HUGE difference. 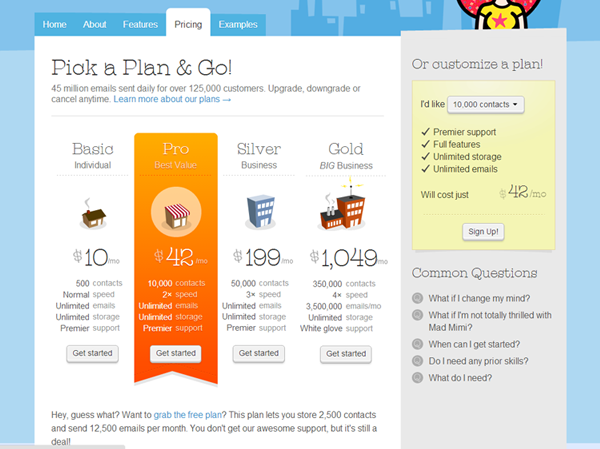 The Mad Mimi pricing page is EXACTLY as it was before the test. Nary a change, optimization or copy edit has been made. Now, am I shocked to discover this? For the reality is that, far too often, A/B test results end up going the way of the dodo. A lot of [businesses] never actually update their page when a test wins. …Why that is the case is another post entirely… because I have noooo idea what’s holding people back from hard-coding winners. So why do so many organizations devote time, budget and resources to conduct an A/B test, only to ignore the results in the end? Now, granted, I am not privy to the internal conversations of the Mad Mimi UX squad. I do not know why they have left their pricing page as-is in the wake of a statistically-significant test that revealed the page’s shortcomings… and opportunities. But I have been privy to such conversations in other organizations and, in my experience, one of the main reasons A/B tests go un-acted upon is POLITICS… and not the elephant and donkey kind, either. Internal politics is a necessary evil in the corporate world. Sometimes it has its uses: resulting in a higher-level of quality control. And sometimes it is a mind-numbing abyss that grinds innovation to a soul-crushing halt. Someone of a certain title forms a hypothesis before the start of the A/B test and, upon hearing results that differ from said hypothesis, they proclaim that the test must be flawed in some way. In which case, either another soon-to-be-equally-ignored-unless-it-proves-the-aforementioned-hypothesis A/B test is commissioned; or the initial test findings are abandoned entirely in favor of no change at all or optimizations based on the gut feeling of that someone with a certain title. Now, this is not to say that you and your organization should blindly follow the outcome of every A/B test. Digital is both a science and an art; and should be informed by both data and human inspiration. There was many a time when Steve Jobs completely ignored user research — to Apple’s, and the world’s, benefit. However, in the case of Mad Mimi, given the huge uptick in click-thrus, and the minimal copy edits involved in achieving that result, not permanently switching over to Variation C is a huge miss for Team Mimi — not just in achieving a better user experience, but increased revenue as well.